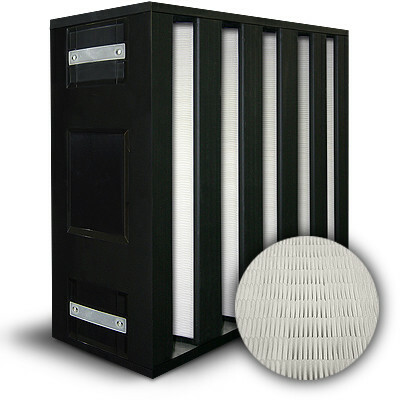 24x24x12 BlackBOX 5 V-Cell ASHRAE 95% MERV 14/F8 Plastic Frame Box Filter Gasket Air Entry/Exit (Both Sides) | Air Filters, Inc.
Air Filters Incorporated™ BlackBOX™ 24"x24"x12" box style V-Cell filters w/Air Entry/Exit Gasket (Both Sides) with 20% percent additional filter area and can direct replacement for older less efficient rigid cell filters. 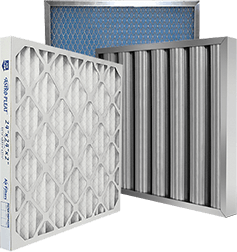 Perfectly designed for use in air filtration systems using filter banks and/or side access housings. These filters are specifically designed for use with compressors, gas turbine and industrial engines. Black Box™ V-Cell provides a superior combination of low pressure drop and high efficiency through the use of our unique mini-pleat design. This extended surface design ensures low resistance to airflow and reduce energy cost.